Home>News of Construction and Building > What are steel frame structures famous for? What are steel frame structures famous for? This immense strength is of great advantage to buildings. The other important feature of steel framing is its flexibility. It can bend without cracking, which is another great advantage, as a steel building can flex when it is pushed to one side by say, wind, or an earthquake. The third characteristic of steel is its plasticity or ductility. This means that when subjected to great force, it will not suddenly crack like glass, but slowly bend out of shape. This property allows steel buildings to bend out of shape, or deform, thus giving warning to inhabitants to escape. Failure in steel frames is not sudden - a steel structure rarely collapses. Steel in most cases performs far better in earthquake than most other materials because of these properties. However one important property of steel is that it quickly loses its strength in a fire. At 500 degrees Celsius (930 degrees F), mild steel can lose almost half its strength. This is what happened at the collapse of the World Trade Towers in 2001. Therefore, steel in buildings must be protected from fire or high temperature; this is usually done by wrapping it with boards or spray-on material called fire protection. Bolted Steel Construction occurs when steel fabricators produce finished and painted steel components, which are then shipped to the site and simply bolted in place. This is the preferred method of steel construction, as the bulk of the fabrication can be done in workshops, with the right machinery, lighting, and work conditions. The size of the components are governed by the size of the truck or trailer they are shipped in, usually with a max length of 6m (20ft) for normal trucks or 12m (40ft) for long trailers. Since the only work to be done at site is lifting the steel members into place (with cranes) and bolting, the work at site is tremendously fast. 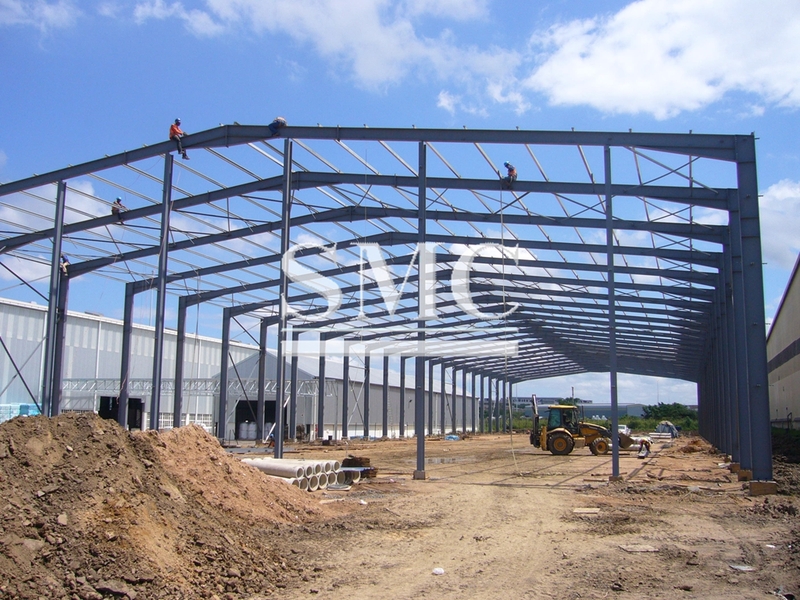 Pre-engineered buildings are an example of bolted steel construction that is designed, fabricated, shipped and erected by one company to the owner. 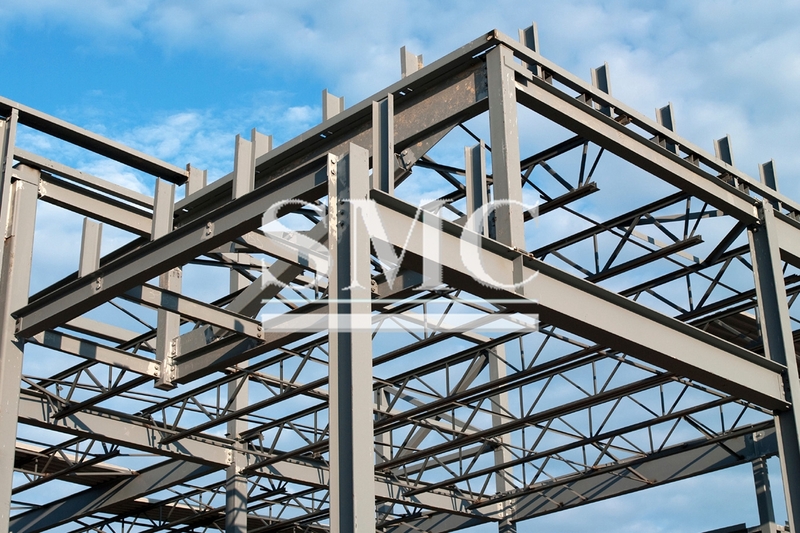 Light Gauge Steel Construction is a type of construction that is common for residential and small buildings in North America and parts of Europe. This is similar to wood framed construction, except that light gauge steel members are used in place of wood two-by-fours. Light gauge steel is steel that is in the form of thin (1-3mm) sheets of steel that have been bent into shape to form C-sections or Z-sections. Consider a single storey building measuring 5 x 8m (16 x 26ft). Let us first construct this in concrete, with four columns at the corners, beams spanning between the columns, and a 150mm (6") thick concrete slab at the top. Such a structure would weigh about 800 kg/m2, or 32 Tons (32,000 kg) in total. If we build this of steel instead, with a sloping roof covered with corrugated metal sheeting with insulation, this would weigh only about 65 kg/m2. The steel framed building will weigh only 2.6 Tons (2,600 kg). So the concrete building is over 12 times heavier! This is for single storey structures - in multi-storey structures, the difference will be less, as the floors in multi-storey steel buildings are built of concrete slabs for economy - but the difference is still significant. This low weight of steel frame buildings means that they have to be firmly bolted to the foundations to resist wind forces, else they could be blown away like deck umbrellas! Steel structures have the following disadvantages are that they lose strength at high temperatures, and are susceptible to fire and they are prone to corrosion in humid or marine environments.